Placed in the corner of the Archaeology Gallery next to the Roman case used to stand a rather interesting object, a stone altar dedicated to the God Hercules. 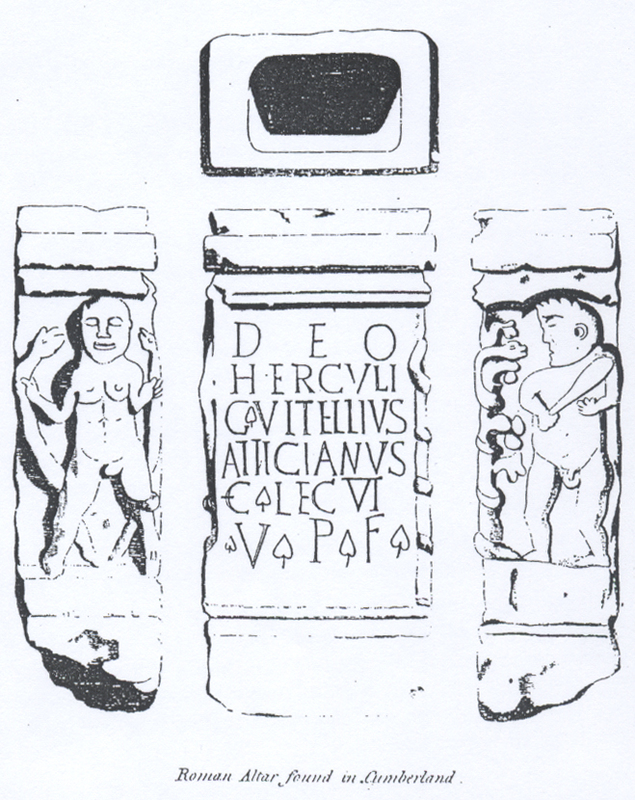 The label behind the altar stated that it had originally been found at the Roman Fort known as Whitley Castle in Northumberland. The first question that springs to mind having read the label is, “why is it here in Bedford Museum”? The challenge to track down the answer began. By searching through our own records and consulting other published sources the answer proved to be very interesting and highlighted the odd and unusual ways that archaeological objects end up where they do. The site of the Roman fort at Whitley had been known about by antiquarians and surveyors since the early seventeenth century. It seems that over the next two hundred years many Roman artefacts were dug up and removed from the fort. 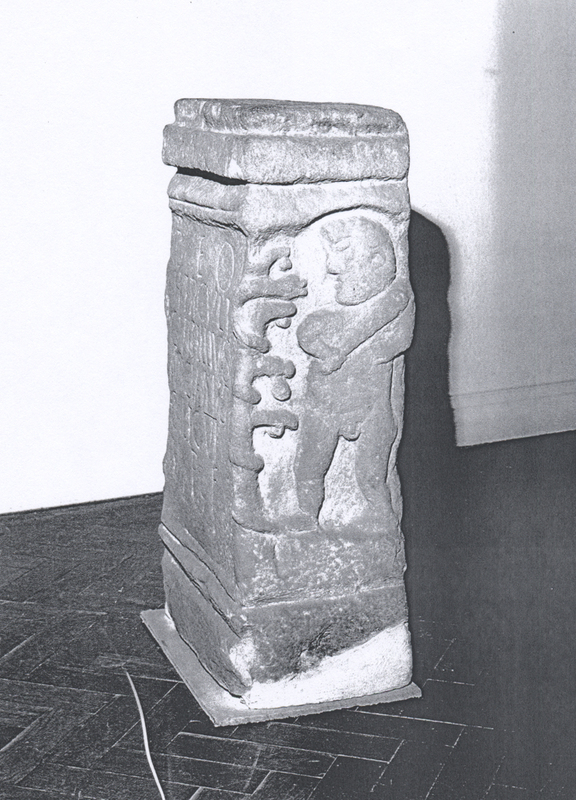 Various records show that several altars and stone sculptures together with all sorts of other archaeological material were taken off the site. Some of these items found their way into the personal collections of notable antiquarians others were put on show in local ale-houses and farmhouses and others were simply lost. The fate and travels of the Hercules Alter has been particularly bizarre. Records show that the altar was kept at a public house near to the fort for a number of years before being purchased and taken down to London in 1812. Once in London it seems that the altar was sold at least twice more to other collectors before, in 1924, ending up in the private collection of Mr. J L Higgins the owner of Turvey Abbey. The altar seems to have stood in the garden at Turvey Abbey for many years until it was donated to the Bedford Modern School Collection by Mr. and Mrs. Rupert Allen. At the time the altar was described as one of the star attractions at the new museum on The Embankment by the curator at the time Mr F W Kuhlicke. Since then the altar has been on the move again, firstly to the current Bedford Museum and more recently to our off-site stores. With all of these moves it is quite remarkable that it has not come to any harm and that the carvings and inscriptions are still fairly clear. I almost dread to think how it would have packed and moved in the past, presumably by horse power but maybe by canal barge or even train, especially on its long journeys into and out of London. When the time came for us to pack and move the altar ourselves we were very apprehensive. The altar is quite large, 863mm high and 457mm wide and seemed to be pretty heavy, we manoeuvred a suitable packing crate along side the altar and with the help of the strongest removal man on the team the altar was inched safely into its padded crate. Phew! Thanks Liz - very interesting. What records could you use to trace this journey? In a nutshell the types of records consulted included museum object history files, "Whitley Castle, Tynedale, Northumberland. An Archaeological Investigation of the Roman Fort and its Setting".D. Wentworth and S. Ainsworth. English Heritage 2009 and site guides. Rupert Allen was my great, great uncle. I am an Australian and my family and I will visit Bedfordshire this coming June (2012). Is there any chance of viewing the altar at your off-site store?